To be honest, when I decided to book my trip to Austria a big motive was Hallstatt. While scrolling through Instagram I noticed, picture after picture, that this secluded village is charming from every angle and through every lens. After setting my main target, I started researching about other places worth exploring and found the most incredible lakes, alpine roads and mountain tops. Austria's nature is breathtaking! Hallstatt thrives between the impressive Salzkammergut mountains and the Hallstatt Lake. This historical village dates back to more than 7000 years and is considered the oldest still-inhabited village in Europe. The oldest salt mine (300 years) is nestled right above the picturesque homes and was active until 1960. Now tourists can use the funicular railway to visit this ancient salt mine with its subterranean salt lake. How can I get to Hallstatt? As a friendly advice, I would say it is worth renting a car and exploring as much as you can from the Salzkammergut region. It has so much to offer, that it would be a pity to only visit Hallstatt. If you do choose this option, try to reach the village as early in the morning as possible. Driving is not permitted in the city centre during the day, but there are 3 walking distance parking areas. They do fill up quickly, due to the high-popularity of the area. We went on a Monday morning (at 8 a.m.) and had plenty of parking choices. In the afternoon however, cars were waiting in line to catch an empty place. Take the train to Attnang-Puchheim and change to the train towards Hallstatt. At arrival, take the ferry to Hallstatt port. Take the train to Attnang-Puchheim and change to the train towards Hallstatt. Then take the ferry to Hallstatt port. What should I do in Hallstatt? There are two options, you can either take a ferry, or rent a boat and explore by yourself. I would definitely recommend the second option, as the view from the lake is amazing and the atmosphere so peaceful. If you had a big lunch, as we did, and don’t prefer rowing, there are electrical boats available for 15 €. This would be my number one recommendation for Hallstatt. I am sure you will love it! It is hard to miss the colorful market square. A beautiful lively place to sit and watch the world pass by, while you are enjoying a dessert of coffee. If you are into souvenirs, this is the place you can find the most choices. Salt products are in high demand. If you walk up the hill to St. Michael’s Chapel, you will find a tiny and colorful cemetery. This is the only cemetery in Hallstatt, so the burial area is very limited. Because of this, a person can only get up to 10 years of staying underground, after that the bones are transferred to the bone house. The room is filled with painted skulls. To identify the deceased, the skulls have decorative paintings and inscriptions, such as names or initials. A funicular can take you up the mountain, from where you can enjoy a breath-taking view of the Hallstatt area. You are now 350 meters above the roofs of Hallstatt village, on a glass platform. The viewing platform is a great place to have your picture taken, but try to beat the crowds by going in the morning or just before closing (summer time 9 am to 6 pm). You have the option of purchasing a combined ticket, including the funicular rides and salt mine tour, for 30 € per adult. If you got up to enjoy the view from Skywalk, then you definitely should visit the oldest salt mine in Europe. It comes with a fun 64 meters long wooden slide and a mine train ride. Where should I eat in Hallstatt? When exiting the salt mine, just follow the Wienerschnitzel smell. It will take you straight to the only restaurant around. It comes with good food, friendly staff and incredible views of the Hallstatt lake. If you cannot get enough of the amazing Hallstatt views, than choose a lake side table and enjoy their delicious goulash soup. If you are looking for a quick meal at an affordable price, look no further. This food stall is situated right at the entrance of Hallstatt and people rave about its burgers. This tiny, but cozy place serves a variety of coffees and authentic desserts, such as Strudel. It is hard to miss this place, located right in the center of Hallstatt. There are lots of options to choose from. Parking can be very difficult to find, especially during the summer months. If you arrive at an unfortunate peak time, a good trick is to continue driving to the ferry in Obertraun on the other side of the lake, where you can park for free. Try to reach Hallstatt as early in the morning as possible. You will have the beautiful scenery, morning light and serenity all for yourself. The destination is popular among Asian tourists and it can get really crowded, loosing some of its charm. It is hard to find open restaurants at all times. Check and plan in advance your options, as restaurants in Austria have special opening times for breakfast, lunch and dinner. Also, some of the staff might be a bit unfriendly, due to the high influx of tourists. Don’t miss the waterfall, which is channeling right through the village. Hallstatt is a very interesting place to roam through. With its colorful homes carved in the mountain, tiny and hilly alleys, it is a joy to wander away from the city center. Keep in mind that you will pass locals’ homes and respect their privacy. 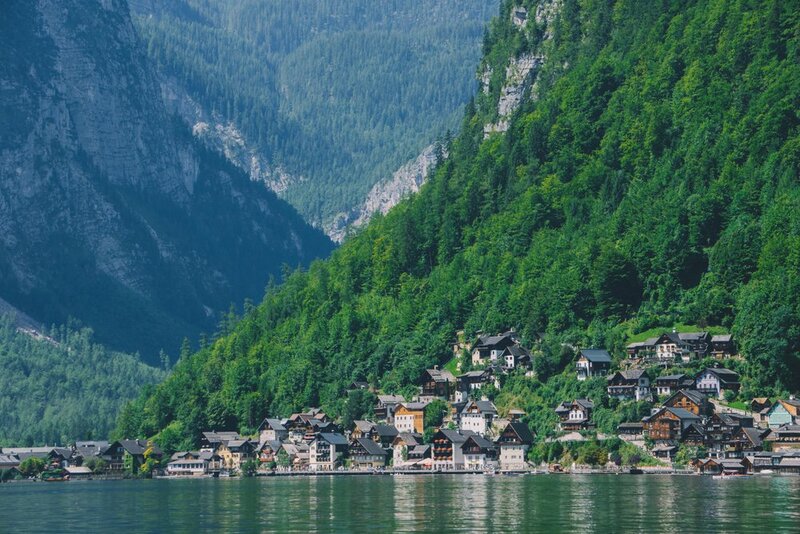 There are only around 600 people still living in Hallstatt. I hope this article inspired you to visit Austria beyond Vienna and give this charming village a try. If you do decide to book your trip, let me know, so that I can give you more tips for an enjoyable experience.